Hello everyone. I've started working on a side project titled 'Breezy' and wanted to keep it publicly playable while it's in development (in contrast to my main project which I made a bad habit of keeping hidden to myself). Breezy is a platformer where you find different ways of moving and can customize your character with them to move however you like. There are big dandelions laid around that start timed challenges to collect pollen, and some movement setups will make this easier than others. Right now the game is just a short prototype you can grab on itch.io for Windows and Mac. I'll be uploading updates hopefully semi-regularly with a post on the latest changes. ​Hello, it's time for Breezy's first update. The short version of this post is that there's a new demo area in the current build which you can try right now. One of the first things I wanted to do was to get objects moving around in various ways for levels and challenges, so this update features a small demo area in the hub with various dynamic elements in it. Pollen, platforms, and even float-space can now be moved around during and outside of challenges. Movement types include moving between set positions, radial orbiting, snake trails, and mirroring the players movement (not shown in level). Additionally, there are now spawners that can continuously create pollen and platforms, as well as 'destroyers' which can remove them at set positions. Normally the game will count up all the pollen in an area and use that number as the 'max' number of pollen you can get, but in this situation the game knows to account for dynamically created pollen and opt out of adding it to the total pollen count and will instead use the preset requirement amount associated with the challenge. 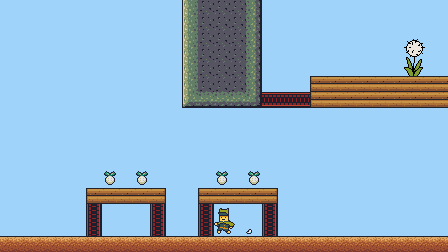 -There's now a panel that can force the player to do one of their movement actions whenever the player touches it, though I didn't do anything with this in the test area. -Changes to when player animations are switched, which maybe makes things slightly more optimized and animation overlap stuttering slightly less prevalent. ​-Integrate a point-system for equippable actions and characteristics where you'll have to pick and choose which abilities you want applied. -A loadout system where you can make preset packages of various abilities that are easy to switch between. 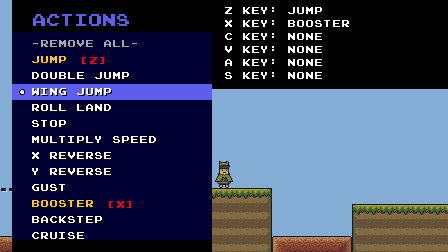 For this version I started out on implementing the ability to set and apply loadouts for different collections of abilities, which has worked out pretty well, although there's no way currently to identify which loadouts contain which abilities, so I'll need to think of a way to do that later. I didn't feel like that would be enough to constitute an update so I also spent most of the time making new types of pollen that have different effects when you collect them (Complete with its' own demo area accessible from the Hub). Right now I'm thinking all the pollen types in the demo will be all the types there are in the full game, so it's nice to have that covered. I'm thinking I'll either be making a more complete set of animations for the player (currently only have ~10% of the total number of animations I'd like to have in the game) or I'll work on finishing up the functionality of all the special actions and characteristics. Unfortunately I don't think either of these will be able to be shown in full in the next demo because they're reliant on showing all the abilities in the game to the player from the get go, which I'd like to save for when the game's finished.